From the multi-awarded My First Lab microscope series comes the MFL Duo-Scope, Winner of The Top Toy Award by Creative Child Magazine and Still the # 1 Best Selling Microscope; specially designed and developed to allow young scientists, ages nine and over, to examine specimens such as Blood Cells or Organ Tissue on real microscope slides, as well as view small solid objects like Plants, Coins and Insects. With its Dual cool LED illumination, the Duo-Scope is two microscopes in one, in that it can function as either a compound microscope, with the light shining up from underneath, for viewing microscope slides, or it can function as a dissecting stereo microscope, where the light shines down from above, for use when observing solid objects. The Duo-Scope assures that everyone will be amazed by the detail in the magnified images they will now be able to see. Designed for maximum portability, the Duo-Scope features an impact-resistant frame and is AA battery powered, so whether examining the surface of a coin in the attic, studying a tiny insect's hairy legs in the garage, or checking out different rocks and leaves in the yard, the Duo-Scope is the ideal companion for venturing out into the Exciting World of Science. 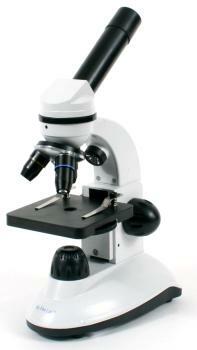 Q – I SAW ANOTHER MICROSCOPE WITH 1600X MAGNIFICATION. IS THAT MICROECSPE BETTER BECAUSE IT OFFERS ME A HIGHER MAGNIFICATION? A – Not exactly. A higher magnification does not always translate into a better microscope since clarity is the most important attribute to consider. At 1000X magnification, OIL between the objective and lens is sometimes required in order to achieve better clarity. We have carefully selected a range of magnification that will be easily viewed by our young scientists to avoid frustration when making adjustments to higher magnifications. Q – CAN THE DUO SCOPE BE USED FOR REAL-LIFE EDUCATIONAL APPLICATIONS, LIKE SCHOOL PROJECTS? A – Absolutely Yes! , the Duo-Scope is an authentic laboratory-grade scientific tool that will accompany the user all through their high-school education.Q – HOW DO I KNOW WHAT MICROSCOPE TO BUY? A - The type of microscope to buy depends on your intended application, because basically, STEREO MICROSCOPES, Offer lower magnification and are primarily intended for applications that require you to “work” in a magnified work-space and provide you with the ability to view specimens that do not fit on a microscope slide. A compound microscope offers higher magnification and is used to view specimen so small that it needs to be mounted on a slide. 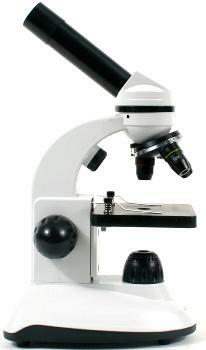 DUO-SCOPES are dual functioning microscopes that can do a little of both! Q – I SAW A CHEAPER MICROSCOPE. WHAT MAKES THIS ONE BETTER? A - We only use glass optics. Buying a microscope with plastic optics is like comparing looking through a clean window and a dirty window. Even if you do not buy our microscope we recommend you buy a microscope with glass optics Q – HOW DO I KNOW IF I AM ON THE RIGHT MAGNIFICATION? A – Magnification is determined by multiplying the power of the eyepiece, with the power of the objective. The Duo-Scope features a 10x eyepiece, a 4x objective, a 10x objective and a 40X objective, thus providing the used with a range of 40x to 400x magnification. Q – HOW DO I KNOW HOW MUCH MAGNIFICATION I NEED? A – The amount of magnification needed depends on your intended application, the specimen type. See the chart below: A.1 - 10x to 40x is the ideal magnification range for viewing Insects, jewelry, keys, and even small toys. A.2 - At 40x to 100x magnification, cells and organ tissue are now visible, as well as some smaller solid items. A.3 - 100x to 400x magnification is the most frequently used magnification range for general laboratory applications and offers higher definition images of blood cells and organ tissue and nerves. 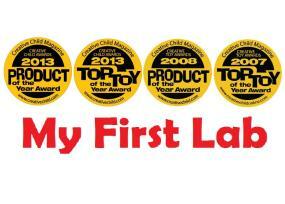 # 1 Best Selling Microscopes! Hours of Fun and Learning! Kids and adults will be amazed by the detailed magnified images they will be able to see of everyday items. Whether bringing into focus otherwise imperceptible nuances on the surface of a coin or offering a close look at a tiny insect's hairy legs, the Duo-Scope is designed to promote hours of fun and learning through discovery. My First Lab Ultimate Microscope!